TRUMBULL – State Reps. Laura Devlin (R-134), David Rutigliano (R-123) and Ben McGorty (R-122) along with Trumbull First Selectwoman Vicki Tesoro, the Trumbull Police Department and Trumbull Public Works Department, the Stop and Shop management team and members of Trumbull Animal Group (TAG) were present for the unveiling of the newest ‘Heat Kills – If you love ’em, don’t leave ’em’ awareness program sign installed at the entrance to the Stop and Shop Plaza off of Quality Road. 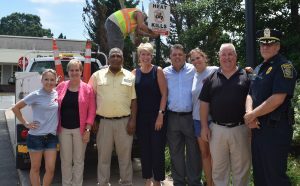 Last summer, the Trumbull State Representatives kicked this Public Safety Awareness Program to remind residents about the dangers of leaving children and animals in cars. The goal is recruit businesses throughout Trumbull put up signage and window stickers to spread the word about keeping children and animals safe. 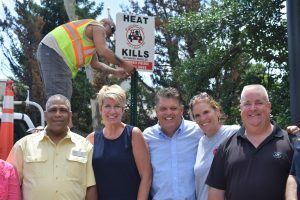 Within the last week, Rep. Devlin has received word from the Westfield Mall in Trumbull that they will also display ‘Heat Kills’ signage in the mall parking lot. ‘This is great community program that will save lives. I ask anyone out there to use their good judgment and protect the welfare of your children and pets,” said Rep. Rutigliano. All three legislators said they supported a bill this legislative session which gives immunity to any ‘Good Samaritan’ who enters the car by force and protects the ‘Good Samaritan’ against any potential civil damages or criminal penalties when rendering aid.